May 24 is the Day of Bulgarian Education and Culture and the Slavic alphabet - the most beautiful Bulgarian national holiday. 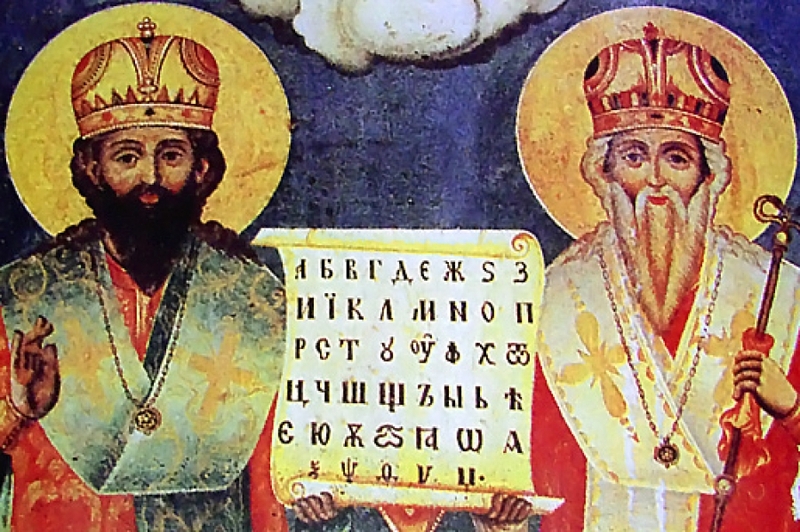 In celebration of the letters honoring Saints Cyril and Methodius - creators of the Cyrillic alphabet. Feast of the letters is a special date for all Bulgarians. Wherever he is, every Bulgarian keeps the memory of cheerful atmosphere in this May day. The earliest data for marking May 11 as the day of the Holy Apostles and Slavonic educators Cyril and Methodius date from the XII century, they are recognized as saints at the end of the IX century. In 1892 Mihaylovski wrote the text of the anthem vseuchilishtniya known to every Bulgarian with his first verse "Go, revived nation." The anthem is titled "Hima of St. Kirila and Methods "and includes 14 stanzas of which we now perform most often first six. The composer Nikolay Pipkov of 11.05.1900, the music for the anthem. May 24 is a holiday, as have other nations in the world - a celebration of literacy, education and culture. Celebration of spiritual upliftment, of striving for improvement through science and culture. Letters created by Cyril and Methodius, the translations that make up the most important liturgical books, protecting the right of every people to glorify God in their own language are of historic significance not only for the formation of the Bulgarian nation and its prosperity. Their work is, democratic, and vseslavyansko serving the great universal idea of ​​equality of all spiritual realm.